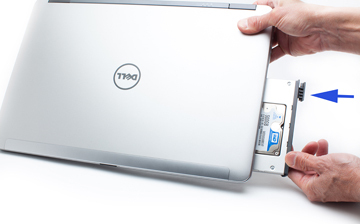 Adding a 2nd Hard Drive or 2.5" SSD to the new DELL Latitude E6540, E6440 is a simple task. All you would need is the proper "HDD Caddy" specifically designed for the laptop. The DELL Modular Bay with optical drive has a built-in eject / latch locking mechanism. You can easily remove the optical drive by pressing on the eject latch on the optical drive. This releases a lock and the latch will eject out of the optical DVD drive. You can then pull on the latch to pull the optical DVD drive out. These modular bays are hot swapple, therefore you can remove the optical drive and insert the HDD caddy while the laptop is running. Once you have the optical drive out, you can insert the 2nd HDD caddy (with HDD or SSD installed). Once inserted, press on the latch so the HDD caddy locks in place. If you are installing a new hard drive (never been formatted or partitioned), you will have to format and partition the new drive for Windows to recognize the new drive. Please see below for our step-by-step 2nd HDD / SSD installation guide. 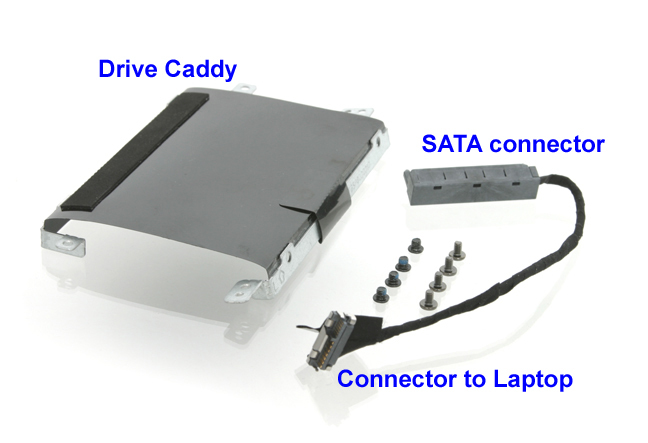 Secure the hard drive or SSD to the bottom of the caddy with the four screws provided with the caddy. Screw hole locations indicated by arrows in the photo below. For more detailed instructions, click on the link below for the video guide.